I was awakened this morning to hear that my good friend and classmate, Father Tony Olges, had died from his lung cancer. I just saw him Tuesday at his home. I had scheduled a lunch at my house for him, myself and two other classmates - Tony Taschetta of Joliet and Gary Marvin from here in Louisville. Tony had to cancel our lunch appointment to go to a chemo treatment early that afternoon and was not able to attend. After saying "goodbye" on his porch, we planned to get together for another lunch "when he got to feeling better." We knew that day that it was very serious, but I don't think any of us had any idea last Tuesday that it would be over so quickly. We thought he might have several months at least. Tony and I went to four years of high school, four years of college and four years of theology together and have served as priests in the Archdiocese of Louisville for forty-six years. Tony was, academically, a very high achiever. He was very well read. He had a "wicked" sense of humor. He willing took on demanding pastoral assignments. He gave concise, insightful and well-prepared homilies. One of my favorite memories of him was from college seminary. After sleeping in on the weekend, we would wake him up around 10:00 am. He would rub his eyes and ask, "Has the sun broke yet?" Rest in peace, brother, we are going to miss you but we are happy to know that you will not be suffering anymore! From our group graduation picture from St. Thomas Seminary in 1966.
in 1966. Yes, seminarians were wearing cassocks that year. Jack Anderson never likes to have his picture taken so I only have this one clipped out of a group picture around 1968. Jack, who is now a resident of Nazareth Home, has been a good friend and loyal supporter of mine since my days at St. Meinrad Seminary - and remains so to this day. I try to go see him every week. I was about this old when I first met Jack, through a mutual friend - Mrs. Wilhelmine King. Jack gave me this ceramic priest when I was ordained a priest in 1970. I have moved it with me throughout the last 46 years. This statue, like me, is a little beat up, but still standing. 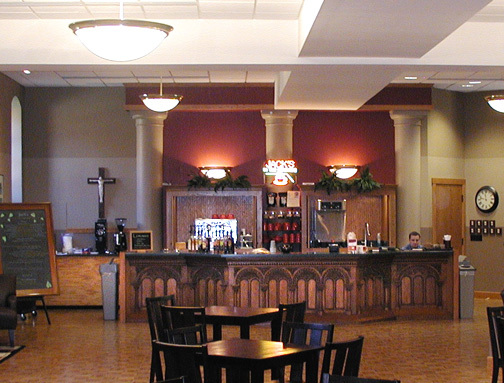 For his 80th birthday, I named the coffee shop that I had built at St. Meinrad Seminary after him. 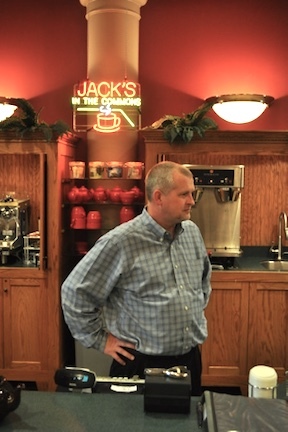 It is called "Jack's." It is a wonderful gathering place for seminarians, monks, staff members and guests. 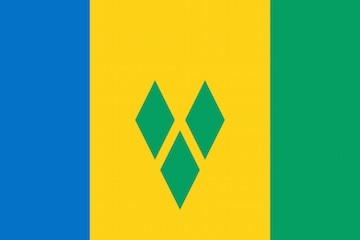 "ST. VINCENT, LAND SO BEAUTIFUL"
St. Vincent is the largest of the 32 islands that make up the country of St. Vincent and the Grenadines. The capitol of the country, Kingstown, is located on St. Vincent. St. Vincent is actually a dormant volcano with people living on the sides and in the caldera (collapsed interior). Most of the other islands are uninhabited. Once an English colony, it became independent in 1979. One of the side streets of Kingstown on the main island of St. Vincent. I have only visited one other island, Bequia, but hope to soon visit the priests on some of the other islands with churches. Coming into the town of Port Elizabeth, around the corner, in Bequia. Princess Margaret Beach in Bequia. I am proud to announce that one of my books will soon be available in a third language: Vietnamese. It was written in English and was translated into Spanish a couple of years ago. The Vietnamese translation will be printed in the United States. I thank Father Thuy Nguyen of the Archdiocese of Regina, Saskatchewan, Canada who volunteered to complete the translation when I was up there leading their convocation of priests. Another one of my books, Intentional Presbyterates, was written in English and has already been translated into Spanish and Swahili. Nineteen years ago, when I was about to leave as pastor of the Cathedral of the Assumption, I took some old floor boards I had retrieved from the renovation project woodpile and had Mr Richard Miller turn those old boards from the floor of the Cathedral into crosses. We bought a wood burning tool to stamp each one. It was a way, I thought, I could bless all the homes of the parish before I left by sending a piece of the Cathedral's old wood floor to each home. The wood, I reminded the parishioners, was "saturated with 125 years of prayers." I blessed them one Sunday and handed them out to every household in attendance. People enthusiastically grabbed them up and took them home with them. My friend and co-worker at Bellarmine University, Ms. Melanie Prejean Sullivan, sent me this picture recently. She told me that she had seen this cross hanging in the home of her friend, Stephanie Hughes. Truly, it is a small world and, yes, sometimes you do something good! While the event raised thousands of dollar from the community, I tried to do my part. My auction items of "Dinner for Six" at my house and a "Treasure Chest of My Books"
brought in well over $1,000!